Holcomb, Kan. (westernkansasnews.com)–Scott City couldn’t have asked for any better of a start Friday night in a GWAC rivalry game in Holcomb against the Longhorns. 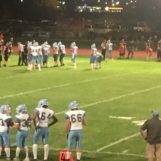 The Beavers scored four times in five first half possessions, and controlled Holcomb on the defensive end, in a 24-0 win. After knocking the Longhorns back 11 yards to their own three yard line on three plays, the Beavers receive the ball at the Holcomb 37. On the first play, Wyatt Hayes took it to the end zone from 37 yards out with 10:04 remaining in the first quarter to lead 7-0 after the Moses Hinojos PAT. After another Longhorn three-and-out, Scott City marched it down the field 54 yards on their second drive. On fourth and goal from the two following a Holcomb penalty, Parker Gooden punched it in from two yards out to go up 14-0 following the Hinojos kick with around three and a half minutes remaining in the first frame. In the second quarter, a six-plus minute drive for Scott City, hindered by penalties, halted their drive at the Longhorn 21. Moses Hinojos drilled a 38-yard field goal with 3:18 left before halftime to go up 24-0. No scoring occurred in the second half. Holcomb did not have a first down in the first half, and ended with three first downs in the second half. Scott City had a pair of drives enter the red zone, but turned it over on downs once, and took a knee to end the game on the second trip. Wyatt Hayes had 16 carries for 145 yards with two touchdowns. The Beavers had 233 on the ground unofficially and 98 yards through the air for 331 total yards. Harrison King played in the first half, and went 3-9 for 55 yards. Parker Gooden took the snaps in the second half and went 4-8 for 43 yards. Marshal Faurot had three receptions for 55 yards. For Holcomb, Peyton Ortner was 6-9 passing for 41 yards. River Amos had two receptions for 23 yards for the Longhorns. Jayson Lambert carried the ball eight time for nine yards. Holcomb had only 12 yards rushing and finished with 53 yards for the game. With the win, Scott City now leads the all-time series 15-4. They won in Holcomb for the first time since 2015, and recorded their first shutout over Holcomb in Holcomb since 2010. It’s also the first time that Scott City has shut out their first two opponents since 1984, when they opened the season with a 26-0 win at Hoxie and Atwood 41-0. That year, they started the season with six straight shutouts. Scott City is 2-0 on the year, and will begin a three-game homestand at Darner Field next Friday night against Goodland. It will be a district game. The Cowboys lost at Ulysses 62-14 and fell to 0-2 on the year. Holcomb is 1-1, and will be at Colby next Friday night. Colby is 2-0 after their 35-6 win at Hugoton.